In this treasured collection of old and new favorites, Dublin born O'Malley not only demonstrates his talent as a master musician but brings to life the heart and soul of his native land. Close your eyes and journey to the "City of Chicago" where wistful immigrants are dreaming of the hills of Donegal. Imagine yourself among the Irish immigrants who found themselves on the battlefields of the Civil War sharing "Mick Ryan's Lament". Experience the fond memory of "Paddy's Green Shamrock Shore"; take "The Night Ferry" back home again to Ireland from a distant shore and find that, in "Westport Town", there's no place like home. You can also a visit a welcoming pub with "I'm a Rover" bid farewell to "The Homes of Donegal" or sing along, in traditional Irish Gaelic, with "Tá Mo Chleamhnas Déanta/My Match was Made." Also on the album are two beautiful and heartfelt love songs: "Éamon an Chnoic" and "Heaven Knows". Finally, rounding out the collection, are fine traditional instrumental renditions of the well-known "O'Carolan's Concerto" and the "Ballydesmond Polkas". This stellar work is a "must have" for any serious collector of the finest in Irish music. 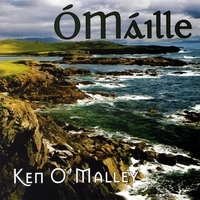 This is a wonderful blend of new and traditional Irish songs, done as only Ken O'Malley can do them with his rich voice. Some moved me to tears and others made me laugh! A good addition to anyone's collection! This CD is a very personal work for one of the best-loved and best-kown Irish singers performing in America today. The title of the CD is Ken's surname in Gaelic, and it becomes obvious as you listen to it that he is singing from his roots artistically, spiritually, and emotionally. There is a depth and richness to Ken's voice as he sings of the Irish immigrant experience following the great Potato Famine of 1847. The diaspora of the Irish following those dark days have fueled many a song and singer, and Ken is no different from them all save in one very important respect: he pours his heart and soul into every song he sings. There is such unbridled passion that flows from the Voice within his voice--he instantly connects with the listener on poignant ballads, love songs, rollicking pub tunes--you feel as if you are a long time friend or a member of his family and that you all have a common history of joys and sorrows shared. For fans of traditional Irish music that is sung in Gaelic, there is nothing like listening to Ken pour out his feeling in his native tongue. Even when he does not sing, when what you are listening to is his stellar mandolin work on Irish reels and polkas from Turlough O'Carolan and others, the heart is there in every note...you somehow know that this man has played before live audiences all his life, and shared his gift freely and gladly to the point where his fingers have no doubt bled. You know as you listen to him that he would do it all again in a heartbeat, at the end of one show he would be planning his next, always willing to share the gift of song that God has so blessed him with. If any of you have had the rare treat of seeing Ken O'Malley perform live, you know what a revelatory and moving experience it is. You can check out Ken's performance schedule on his website, kenomalley.com, and it is well worth making plans to see this man sing live if you ever have the opportunity to do so. While you wait for the chance to see Ken perform, or even if you never get that gift, BUY THIS CD!! It will give you a strong measure of the man and his music, and his proudly beating passionate Irish heart. It will make you smile, and make you cry, but above all it will make you feel very content with and appreciative of simply being human and alive. Try a copy of this CD--you will not be disappointed! I have known Ken a long time. This album is pure O'Malley. At first I was torn as it was different from what I was used to, but after listening to it obsessively about 5,000 times. I realized that it was pure, original and totally Ken O'Malley.